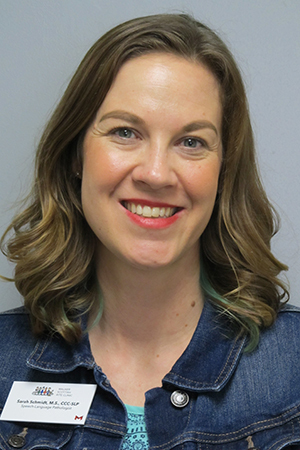 Sarah has her Masters of Science in Speech Language Pathology with an emphasis in education for deaf & hard of hearing from Fontbonne University. Sarah is PECS trained, as well as PROMPT trained. Sarah has worked as a speech language pathologist since 2004, and recently joined the team at Walker Scottish Rite Clinic in 2017. She loves the more personal feel that a clinic setting provides and enjoys being able to develop relationships with parents that help their children be successful communicators. Fun fact about Sarah is that she has a blog dedicated to once a month freezer cooking and believes freezer meals save her sanity on a daily basis. She also loves taking motorcycle rides with her husband and visiting small town, hole in the wall, amazing restaurants.